This CNN website features a news story about the most recent solar hurricanes that have hit Earth. Visitors can learn about the storm's potential to again damage electricity grids, confuse satellites, and disturb GPS readings. The website features amazing aurora borealis images created by a similar solar storm last month and the Solar and Heliospheric Observatory's (SOHO) images of the coronal mass ejection (a stream of superheated gas from the sun), which created the storms. 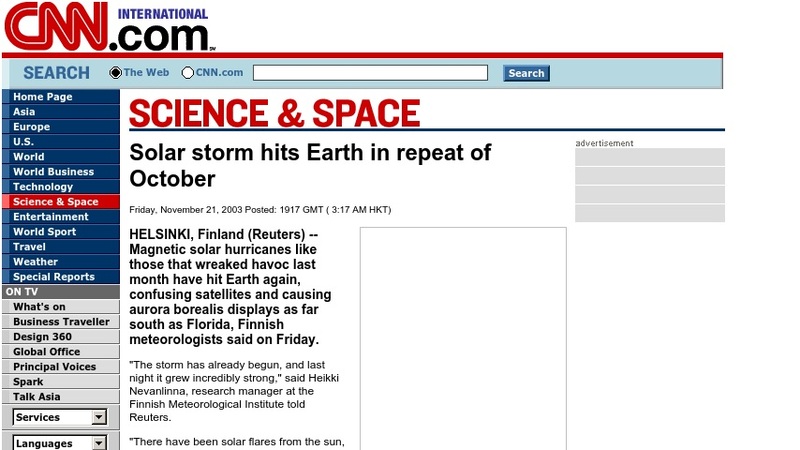 Users can also find links to news stories about previous solar storms.